I’ve always admired Marte’s unique sense of style and her Compagnie M. patterns are equality stylish with a very modern twist. Whilst they may not seem like the most obvious choice for someone (like me) that usually leans towards more classic designs, I actually love every single pattern I’ve used from her – my girl always gets lots of compliments when wearing one of her patterns (for example, here, here and here). Besides great designs for kids, Compagnie M. also features a couple of very clever designs for women. 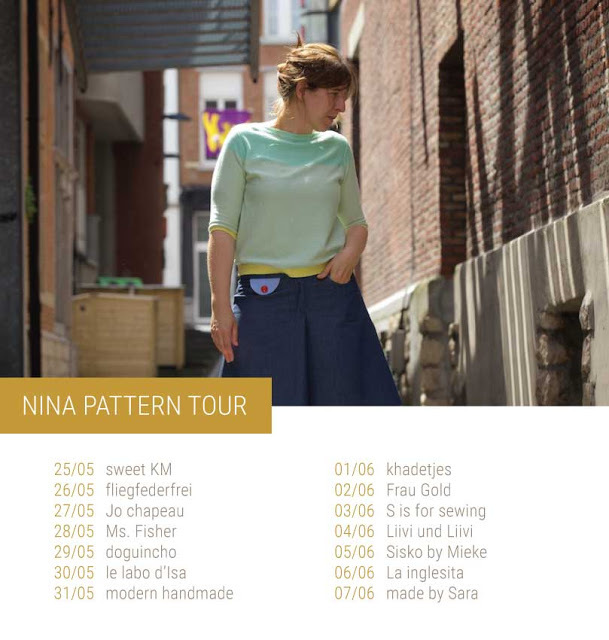 Their latest release is the Nina Skirt and Culottes, including teens and women sizes (available both in paper and pdf versions). 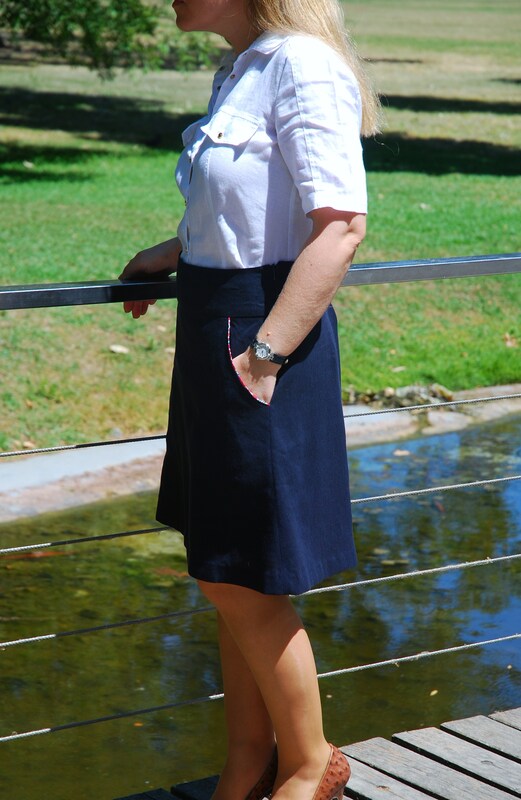 As I don’t think the culottes would suit me (I’m afraid I’m a tad too short for it), I decided to try the skirt which features a lovely A-line shape. Faithful to my style, I chose a simple version with side-invisible zipper and diagonal front pockets. 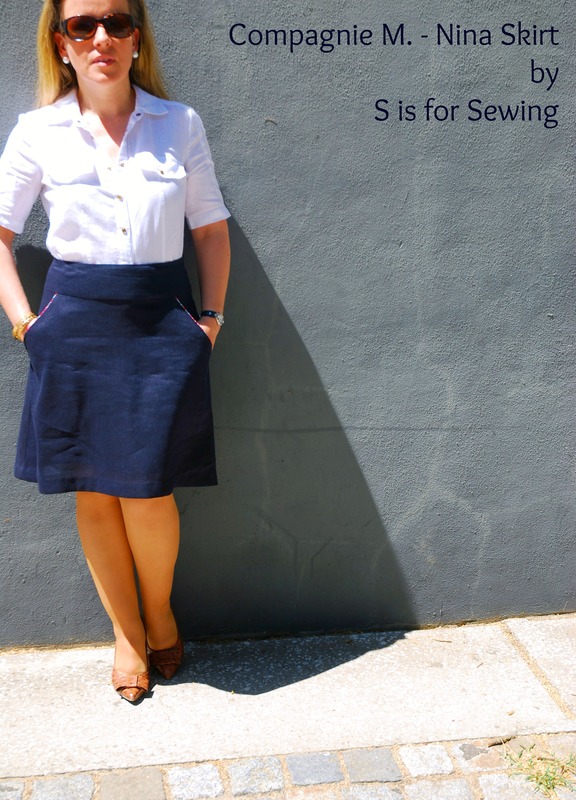 The pattern includes several options for the skirt and the culottes and if you like pockets you won’t be disappointed (obviously I picked the most classic option …). I when shopping with my friend Marta (who, by the way, sew a skirt and a culottes version of this pattern, here) at a newly opened shop, The Craft Company, in Cascais (they stock Liberty fabrics, Merchant & Mills and much more and the store alone is worth a visit – full of sewing antiques and a friendly owner. I’m so thankful I don’t live close enough. My wallet needs a safety distance from this sort of place). Fabrics: Deep blue Linen from Merchant & Mills, Liberty Wiltshire for pockets, piping and waistband lining (unfortunately, I didn’t have enough for a hem facing) and silk taffeta for the skirt lining. The pattern is ready well-written, with step-by-step instructions to guide you along the way. I don’t consider myself an expert in women’s sewing as I’ve only sew a couple of pieces for myself (mostly blouses and tops), so I was quite concerned before starting this skirt. Nevertheless, I had no major issues (even the invisible zipper went smoothly) and although it did took me longer that one of my girl’s dresses ;), it is definitely a pattern for a beginner that is ready/willing to be challenged (a bit)! Linen is a great option for summer clothes – as long as you don’t mind about the wrinkles (which I don’t). This was really light weight (and see-through), a full lining was mandatory. I also added interfacing to the waistband (to give it a bit more structure) and shorten the hem by about 3”. Just a final word of caution: Marte recommends that you sew a muslin before cutting your “good” fabric and I totally second that. Honestly I didn’t sew a muslin, because my friend’s Marta did it before (3 muslin) and I borrow hers to get my fitting right – no major mods were made, but using a muslin did help to get a proper fitting at the end. Thank you so much for this pattern, Marte! Lovely Ana Sofia, very sophisticated and classy!. I love the fabric choice so much and you look fantastic!!!! ,) Thank you so much Kristin! It’s a bit more time-consuming (than children apparel) but I think it’s totally worth it (at least, I’m sure these will last me more than one-season, lol). I like this skirt very much! Well done!!! Very beautiful in linen ! Have to remember this when I sew one for myself ! Ana Sofia, I thinking I need to go back to The Craft Company and get some blue linen too. I LOVE your skirt! The Liverty details look amazing and the drape of the linen is perfect! A perfect summer skirt! Love it! Indeed! 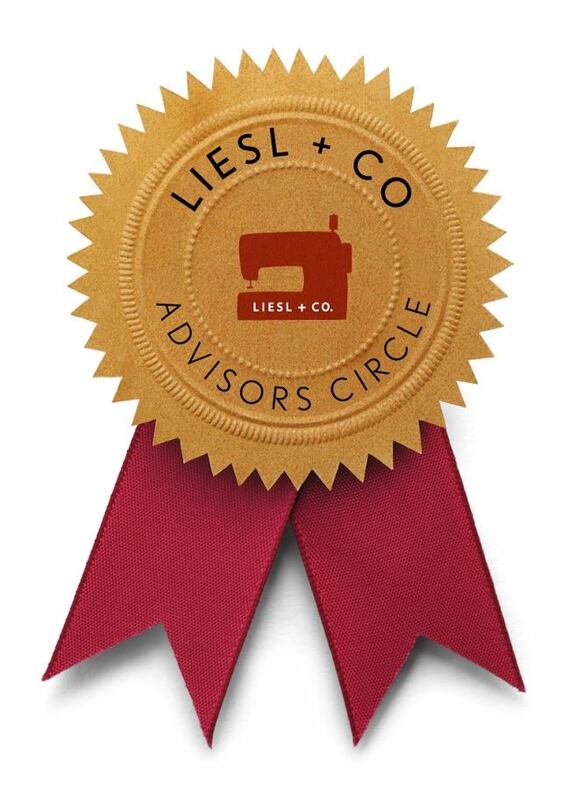 The linen is perfect and it feels so nice. Love the fabric you used for this skirt! It gives a totally new twist to the pattern, and I love it! Lovely and I adore your shoes. It’s absolutely beautiful! 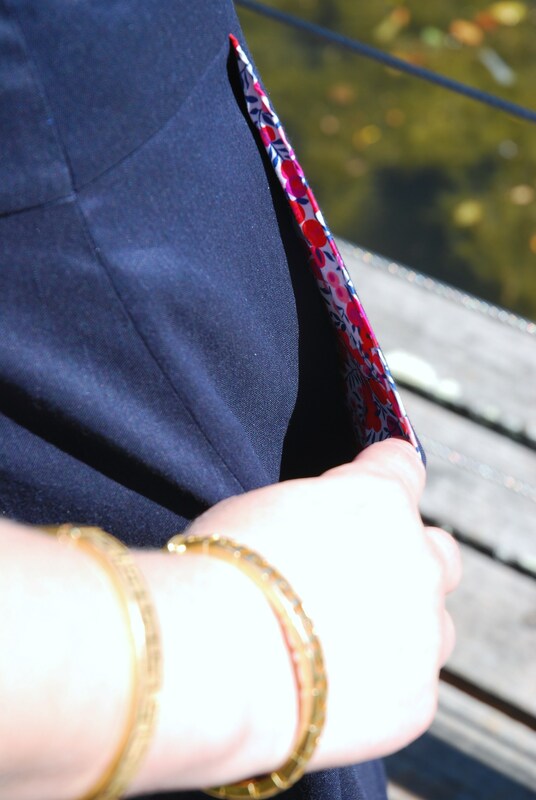 Linen and Liberty are a perfect match! You always have the most amazing fabric choices and style. The skirt looks great on you! Love the flare by the way! And your shoes.